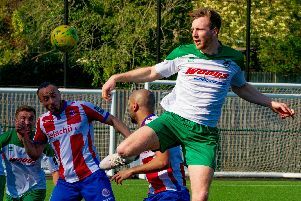 Australian Callum Kealy was at the double to fire Worthing Football Club to a 2-1 opening-day Bostik League Premier Division triumph over Wingate & Finchley at Woodside Road this afternoon. Sean Cronin's spot-kick just past the half-hour was cancelled out by efforts either side of the break from debutant Kealy as Worthing wrapped up all three points in their first game of the new season. New recruit Kealy, one of three summer arrivals to be handed starts by manager Adam Hinshelwood, looked menacing throughout and caused Wingate's backline problems all afternoon - deserving his double as Worthing will look to build on a positive start to the campaign. Summer signings James Crane, David Ajoboye and Callum Kealy were all handed debuts, while 17-year-old Ricky Aguiar made his first senior start for Worthing. Both teams made nervy starts, with Wingate looking more of a threat going forward in the early exchanges. Centre-half Aaran Racine had a let-off after eight minutes. Marc Charles-Smith nipped in to nab the ball as Racine looked to shield the ball out of play before finding Thomas Tejan whose clever turn worked himself some room but Lucas Covolan was equal to his effort. Worthing attackers Ajiboye, Kealy and Aguiar were all playing together in a competitive game for the first time but started to get get more involved as the half wore on. Just as the home side began to get a foothold, it was Wingate who took the lead. Alex Parsons' slight nudge on Robert Laney in the area saw a spot-kick awarded on 33 minutes. Defender Sean Cronin thundered the penalty past Covolan to fire Wingate ahead. Worthing trailed for less than five minutes, with debutants Ajiboye and Kealy combining for the leveller. Former Brighton forward Ajiboye went on a mazy run before picking out Kealy who kept his composure to slot past Shane Gore. The home side then completed the turnaround ten minutes after the restart. Ajiboye was involved again, another driving run seeing him getting at Wingate's backline, the ball fell to Jesse Starkey who picked out Kealy and he slotted home his second. Kealy put Wingate's backline under pressure all afternoon and his effort nearly saw him rewarded with a hat-trick 15 minutes from time. The Aussie pressurised Cronin and took the ball off him but Kealy skewed his shot wide of the target. Wingate threw men forward in the closing stages but failed to find a leveller as Worthing sealed an opening-day win. Worthing make the trip to Carshalton Athletic on Monday in their first away game of the season. WORTHING: Covolan; Young, Racine, Rents; Edwards; Parsons, Ajiboye, Aguiar, Starkey, Crane; Kealy. Subs: Colbran, Budd (Ajiboye, 81), Pattenden, Barker (Edwards, 61), Rance (Starkey, 84).